As married couples navigate life, it is common for them to incur various forms of debt. To be sure, a couple may purchase a house together and have mortgage debt; may buy a car and be liable for car payments; may go to graduate or professional school and incur student loan debt; may suffer a health scare that results in medical debt; or may even just be poor at budgeting and incur credit card debt as a result. Marital Debt – How’s it Divided? Colorado is an equitable distribution state, which means that marital assets must be distributed equitably among the spouses at the time of divorce. This rule also applies to debt; debt must be equitably distributed, but not equally distributed, amongst the two parties during a divorce. Marital debt is typically considered debt that is incurred during the course of the marriage, whereas separate debt is debt that’s incurred prior to a marriage’s formation. Assets acquired during the course of the marriage include those that are only titled in one spouse’s name. For example, if your spouse purchased a new car during your marriage and the car is only in their name, you will likely still be liable for this debt. With this standard in mind, the court does not always hold that all debt accumulated during the marriage is marital debt. In fact, the court may assign debt to one party depending upon the type of debt. For example, if your spouse took frequent trips to Vegas and blew thousands of dollars while there, the court may not hold you liable for this debt. Compromise. Be willing to give up something to get something that you want. The more flexible you are, the better the chances of reaching an agreement out of court. Be amicable. It can be difficult to negotiate with your spouse with a smile on your face. While kindness may feel elusive, try to be amicable. This will encourage your spouse to be amicable as well, which can make reaching an agreement more plausible. Work with a professional. It’s smart to know exactly what your options are, and what the consequences of your divorce settlement will be. A professional accountant or lawyer can guide you and help to protect your best interests. Hire a lawyer. Negotiations can be trying – hire a lawyer to represent you during the process and ensure that you don’t end up with a settlement that unfairly leaves you with mountains of debt. 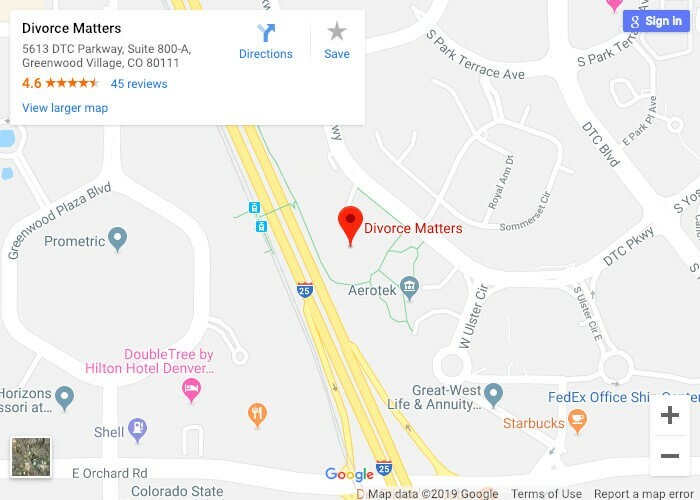 To learn more about debt in a Denver divorce, call our professionals at Divorce Matters today. We are a team of experienced lawyers who work hard for our clients.